Wat Phra Borommathat Nakhon Chum, Kamphaeng Phet Province, Thailand. The temple situated in the centre of Mueang Nakhon Chum (Kamphaeng Phet ancient town) featuring a Burmese-style Chedi. The Chedi itself is believed to originally have been a Sukhothai-type structure, its style having been altered during a restoration work financed by a wealthy Burmese about a century ago. These amulets were found at Wat Phra Borommathat Nakhon Chum on 4 March 2012 during renovating the vihara to be the library for monks and novices. 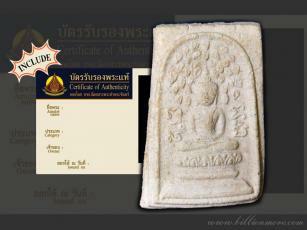 The amulets from Wat Phra Borommathat Nakhon Chum are assumed to be more than 200 years old. Ancient amulets that were found are called "Phra Kroo". In fact, Phra Kroo from Kamphaeng Phet Province have been famous among Thai amulet circle for a long time. Blessing ceremony of this collection was held throughout 3 months in 2016 by abbot and monks in the Buddhist chapel, Phra Borommathat Nakhon Chum and again on 1 April 2017 (the holy day called "Sao Ha"). Objective: The temple requires donations for building the meditation hall. 'Yod Khun Phon' means 'warlord'. 'Soom Rakhang' means 'a bell arch'. 'Soom Ruean Kaew' means 'gem arch'. 'Sam Phi Nong' means 'three brothers'. 'Ku Suad Upatcha' means 'a pair of preceptors'. 'Chumnum Thewada' means 'the assembly of angels'. 'Narai Song Puen' means 'Lord Narayana in Gunning Posture'. 'Naa Lek' means 'a small face'. 'Lang Riab' means 'a smooth back'. 'Lang Kab Mak' means 'a peel of betel nut tree'. 'Choei Kang' means 'to chin up'. 'Kang Met' means 'near the seed-shaped side'. 'Fak Darb' means 'a sword sheath'. 'Athithan' means 'to make a wish'. 'Prok Pho' means 'with Bodhi tree'. 'Kha To' means 'a leg of the table'. "you are terrific and the most trustfully people.Thank."